Sleaszy Rider Records is a label from Greece which has quite a few diverse acts on their roster which probably cover the whole scope of metal music. It is nice to see a label from Greece emerge in these trying times in that country, and I hope they fare better than defunct and missed Black Lotus. Hand of God is a band of a Greek guitarist/songwriter Theodore Ziras, and the label also carries his solo act. Not being familiar with Theodore’s solo carrier, Hand of God is his attempt at gothic tinged, pretty accessible metal, definitely vying for commercial airplay. 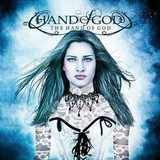 True to the genre, Hand of God is fronted on this eponymous debut by Marissia, a female vocalist with mid-range rocking voice, placed quite a bit up in the mix on the album to be the point of attraction (she is featured on the cover as well). While Marissia’s performance is in no way a downfall on the album, I can’t say that The Hand of God is about to climb my personal gothic metal album charts. For the first half of the album Hand of God follow a repeatable pattern, where guitars provide diffuse heavyset fabric with a periodic chug (No Holding Back) while keyboards splash in the melody here and there. Guitar solos do their best to break up this blueprint, and Signs try for the heavier folk opening riffs, but the first half of the album simply tries too hard to reach a commercial perch and doesn’t entirely get there. Opening single Falling and a quick take on the Finnish gothic style in Start Again still did not do enough to catch my attention. For the first five or so songs Hand of God tries hard, almost too hard, but this is no The Crest or some such act. But then suddenly things change and on Collapse and All About You, it is if Hand of God forgot about the need to stick to the trappings of the genre. Heavier riff on Collapse signals some headbanging, and the hook in the chorus is finally memorable. All About You sticks to the basic rhythm and beats, but rocks as well. It is when the band actually veers closer to classic metal, and worries less about gothic is when they do best. Avoiding vestiges of the necessary semi-ballad was not entirely successful with Endless Circle, but No Regrets and Running Out of Time get back to basics of rock/metal and do well. While I definitely did not hate more gothic first part of the album the songwriting in those songs did not do enough for me. If this is supposed to be some radio-friendly music, then let’s make those melodies stand out and stick. The more traditional metal of The Hand of God did better, but unfortunately the listener will have to be patient to get there, and I can’t say that Marissia is the new coming of Doro Pesch, but she is adequate throughout.